With its new ten-year deal with ESPN in 2007, and weekly airtime on ESPN2, lacrosse has hit the big times. Once a Native American pastime, lacrosse is now a major league franchise with almost half a million players in organized teams. Chapter 1: Lacrosse and You. Chapter 2: Suiting Up: Buying the Right Equipment. Chapter 3: Meeting the Team. Chapter 4: Laying Down the (Lacrosse) Law. Chapter 5: Getting the Ball into the Goal: Developing Offensive Skills. Chapter 6: Putting the Ball in the Goal: Shooting Fundamentals. Chapter 7: Keeping the Ball out of the Goal: Developing Defensive Skills. Chapter 9: The Possession Game. Chapter 10: Practicing Team Offense and Defense. Chapter 11: Calling on the Special Forces: Specialty Teams. Chapter 12: Becoming a Better Lacrosse Player - Physically and Mentally. Chapter 13: Fundamentals of Coaching Lacrosse. Chapter 14: Developing Your Coaching Philosophy for the Offense. Part IV: Following Lacrosse: The Fan`s Point of View. Chapter 16: How to Watch Lacrosse. Chapter 17: Getting in the Game. Chapter 18: Keeping Up with the Pros. Chapter 19: Ten of the Greatest Men`s and Women`s Lacrosse Players. Chapter 20: Ten Reasons to Get Excited about Lacrosse. 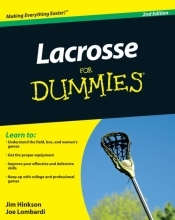 Chapter 21: Ten Interesting Facts about Lacrosse.